THE United Sisterhood is in serious need of financial assistance to avoid closing its Jewish Family Assistance Fund.The United Sisterhood, which will celebrate 75 years of helping the underprivileged in August this year, may have to cut down on supporting projects and people it has assisted for many years, and may have to close the Jewish Family Assistance Fund. The reason for the lack of funds is varied, but neither the Jewish Family Assistance Fund nor the United Sisterhood have suffered from any maladministration or from any misuse or misappropriation of funds. Neither fund has any outstanding creditors. The economic situation in South Africa has hit Jewish community, and many former regular donors are finding it more and more difficult to cope themselves with inflation. 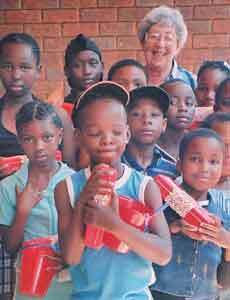 In addition, the Johannesburg Jewish community has become an aging community. Even though interest rates have risen, possibly giving our senior members more income from investments, the cost of living has increased way beyond this income. Their contributions to our Tikkun Olam programmes have either stopped or have been drastically reduced. Another spin-off of the rising cost of living has been that the number of people in need has risen. Black Economic Empowerment (BEE) has also meant that more and more older white South Africans have been retrenched and cannot find employment. The United Sisterhood is unique in that it does not ask what colour people in need are, nor does it ask the gender of these people, nor does it ask them what religion they follow. It asks merely what the need is, and how best to address that need. For the first time in decades, we will have to reduce the special (and very expensive) food we give to the HIV/AIDS sufferers at the MC Weiler and New Nation Schools. We provide transport to and from hospital for the aged Jews living in Hillbrow, Berea and Yeoville so that they can obtain their monthly life-giving medication. We have provided these humanitarian services for many decades. We will have to stop doing all of this unless we raise sufficient funds to do so. Please help us to help all these people! UNITED SISTERHOOD OFFICESInside the grounds of Temple Emanuel, corner Oxford Road and Third Avenue, Parktown. 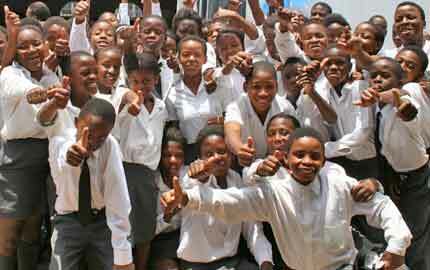 A unique school in the grounds of Bet David has enabled hundreds of poor students from Alexandra to pass their matric. The Mitzvah School recently celebrated 21 years.